coloud headphones philippines - earth friendly? I remember when proper headphones used to be a luxury item and was only practical to be bought and enjoyed by people who needed them in their industry...professional DJ's, sound engineers, etc. Those days, a good pair could easily set you back around 10K. Wow right? And they were huge monstrosities too...which is probably another reason why we stuck with our crappy headsets that came with every purchase of a walkman (dont judge). Not to say those weren't as equally repulsive. Imagine a thin, flimsy metal strip that goes around your head and is glued to your ears with foam covered "ear speakers" that tear apart after a month. (Insert huge wave of nostalgia and Debbie Gibson here). Okay enough with the throwback, let's talk about the present and how lucky we are to be able to enjoy affordable (and VERY stylish) technology now...specifically when it comes to headphones. One of the leading high quality yet affordable headphone brands are now in the Philippines! Introducing Coloud Headphones. The Pop (P895) - for those who prefer something less bulky. The pop is ergonomically designed to deliver a comfortable in-ear fit. It also comes with small, medium and large replacement caps making it easy to fit inside the ears no matter the size. The Pop eliminates any audio pollution around, allowing uninterrupted music listening. The Knock (P1195) - The Knock provides non-stop comfort while you listen to your favorite music. It features comfortable ear foams that don’t trap heat and moisture while delivering clear and crisp sound quality. The Boom (P1495) - has a closed construction design so outside noise stays out. The Boom is also a no-fuss, full pair made of minimal parts, meaning less weight on your head. And the best part! Coloud Headphones are Earth-Friendly! Coloud products are phthalate and PVC free, and packed in 100 percent recyclable material. 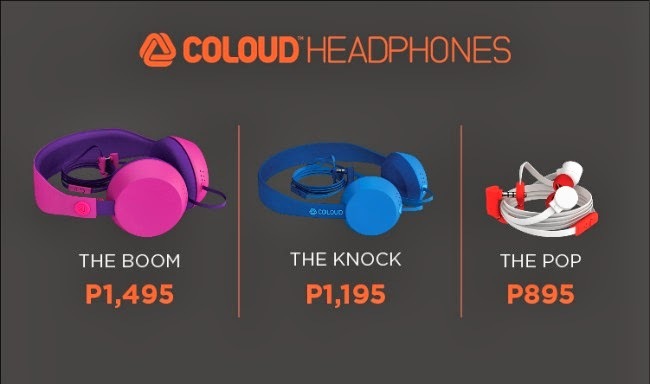 Coloud Headphones are available in the Philippines at Beyond The Box, Bratpack, Buzz, Digital Hub, Digital Walker, Astrovision, Automatic Center, Electroworld, Avant, iCenter, iGig, iStore, iStudio, Mobile 1, Power Hub, Technoholics, and Urbanathletics.